Find out more about the globally rare seals that you see around the Cornish coastline. Seal Group has been carrying out pioneering research since 2000. Find out what we do. 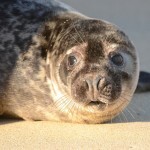 With your help we can make our seas a safer place for seals, other marine life and ourselves! 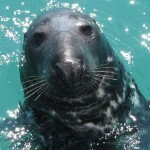 We work with a range of marine related organisations interested in seals and the sea. 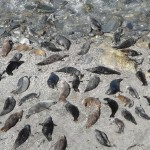 Cornwall Seal Group (CSG) is an evidence based conservation charity supporting a large network of active citizen scientists who routinely survey seals on their local patch in order to learn more about grey seals, a globally rare marine mammal for which the UK has a special legal responsibility to protect (JNCC). CSG encourage everyone to send in their seal sightings (even just one seal in the sea or on land) with a date and location from anywhere around the southwest – photos are a bonus as they help us to confirm if it is a grey seal, whether it is male or female and perhaps even reveal its name and life history! Please email [email protected] with your sightings. 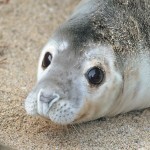 Each seal has a unique fur pattern that enables it to be photo identified throughout its life. Learn the pattern and you can recognise the seal! CSG hold identification catalogues for numerous sites from north Devon round to Dorset. Photo ID is one of the most powerful research tools for studying seals. 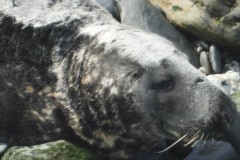 It is a non invasive technique revealing information about lots of different aspects of their biology and ecology and ultimately enabling the life stories of individual seals to be built up over time. 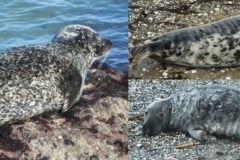 Some key learning outcomes from this work have shown that most of the seals seen at sites in Cornwall just appear to be moving through – stopping off to rest on their way to somewhere else. A small proportion of seals seen at a site will remain there for several months, using the site as their base from which to forage. Very few seals (if any) spend all year in one place. Each seal seems to take a unique pathway and seals seen in Cornwall have also been photo identified in north and south Devon, Wales and France. So if you see a seal in the southwest, please remember to tell us!